food, Italy, languages, Restaurants - let's eat chic, Sardinia, Transport - planes, trains and automobiles, Travel - bon voyage! It’s hard to imagine an island of 5 square kilometers becoming a kingdom on the whim of a royal visitor, yet that’s exactly what happened to tiny Tavolara, off the east coast of Sardinia. When King Charles Albert of Sardinia visited Tavolara in 1836, he bestowed independent royal status upon it and decreed that resident shepherd Giuseppe Bertolioni should be king. The King wanted to show his thanks for the sheep that Bertolioni had presented to him in honour of his arrival on the island, thereby creating what was for many years (1836 – 1962) the smallest kingdom in the world. There isn’t that much information available about Tavolara, should you want to visit, hence this post, which I hope will help any would-be visitors to the island. Monsieur and I visited Tavolara in May of this year, and it was a welcome distraction, yet we’d probably have enjoyed it more had we known more about what is, or rather isn’t there. The main reason for visiting Tavolara, population a whopping 55, is probably to satisfy the curiosity of why such a place might have a king. 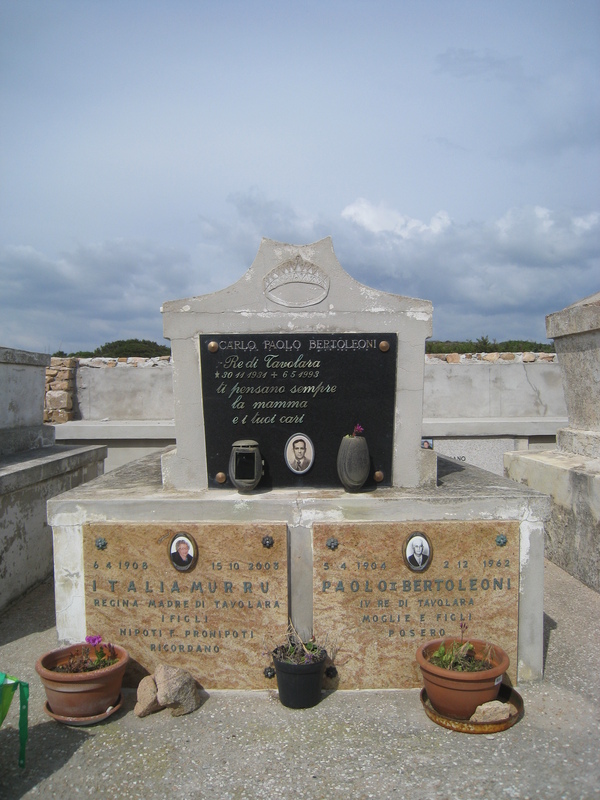 The second reason might be to eat at the island’s one restaurant, Da Tonino (they’ll send a boat to pick you up) and a third might be to pay respects to the deceased island royals in the tiny cemetery. It’s also possible that if you work for NATO you may visit the large chunk of the island serving as a NATO base and absolutely off-limits to the likes of us. There are no cars, bicycles or vehicles on Tavolara (not that we saw, anyway), making us feel a bit silly, having asked if it were possible to take our car across on the ferry. (Admittedly, that was before we saw the ferry.) One walks, as we later found that it’s perfectly easy to circumnavigate the portion of island accessible to non-NATO visitors. Do note that if you decide to visit Tavolara, be sure to bring a picnic with you as there is no shop and when we visited, the restaurant was closed until 1pm, by which time we were ready to head back to Sardinia proper. Our ‘ferry’ was in fact more of a shuttle boat, cram-packed with raucous local kids on a school trip. It was early morning and we’d been led to believe by hotel staff that getting coffee and a couple of breakfast pastries would be possible once we arrived at the island. It wasn’t possible as there is naught but the restaurant, which wouldn’t open for some hours yet. Fortunately, we had water in our packs, but I think you can imagine how hunger might have impacted our view of the island somewhat as my dear husband and I don’t travel too well on empty stomachs, food lovers that we are. By the time the twenty minute boat ride was over, we’d had enough of smurf-swapping and excited screeching (although talking to the kids in basic Italian made me feel as fluent as Dante Alighieri because they understood everything I said), making away from the children as swiftly as our feet would carry us on the sandy paths. Now we understood why the ticket seller had mentioned the school trip, suggesting we might prefer to wait for a later boat. They were loud, as school groups so often are, but quite well-behaved nonetheless. However, later on, as I rinsed my hands in the ladies’ washroom at the back of the (closed) restaurant, one particularly precocious madam pointed at my slightly peeling shoulder, shook her head and tut-tutted. “Shame,” she said. It felt like being scolded by a grandmother in a ten year-old’s body. Monsieur and I walked the length of the island’s main highway – a sand-swept walkway busy with determined lines of rather large ants. 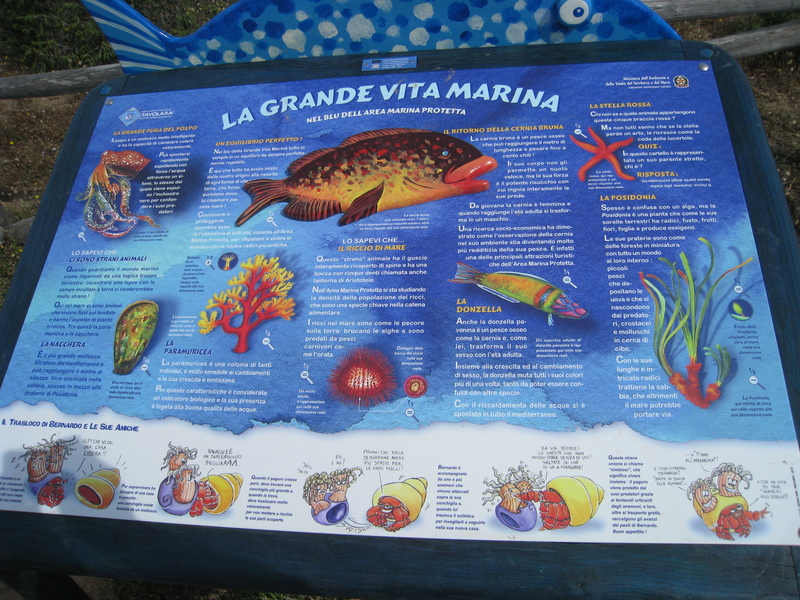 At various points along the way were information boards about the flora and fauna of the island, which was certainly unspoilt. The northern beaches just off the path were too rocky to lure us in for a dip; once we’d visited the cemetery with its rickety wooden gate and had spotted the yellow-teethed goats that share (and eat) the island, we’d pretty much covered all the options open to us. Heading down to the more sheltered southern beach of sand, we dozed for an hour or so until the next boat could take us back to civilisation and, naturalmente, FOOD. 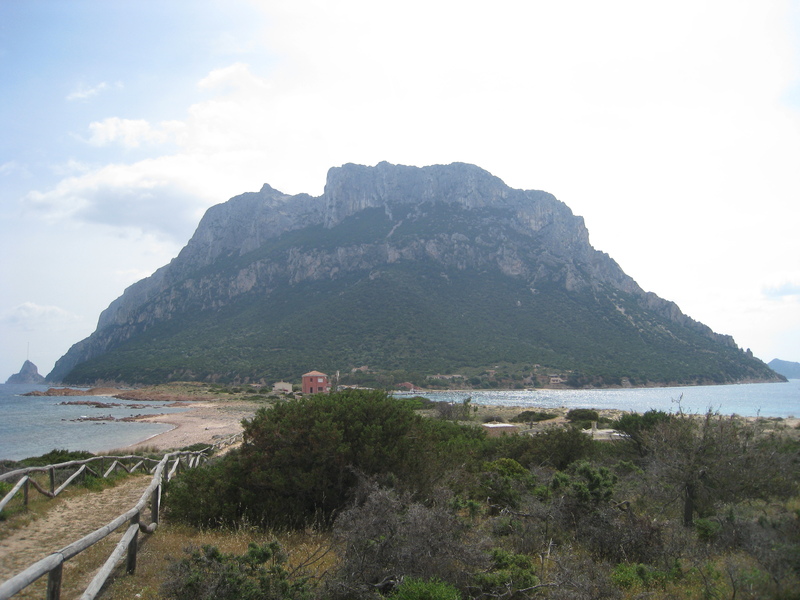 If you’re a botanist or biologist, Tavolara will possibly hold more interest for you; for us, we regretted not knowing to pack a picnic, ‘cos once you’re on the island, you’re on the island and you can’t leave until the next boat, on an inconveniently erratic timetable, arrives. 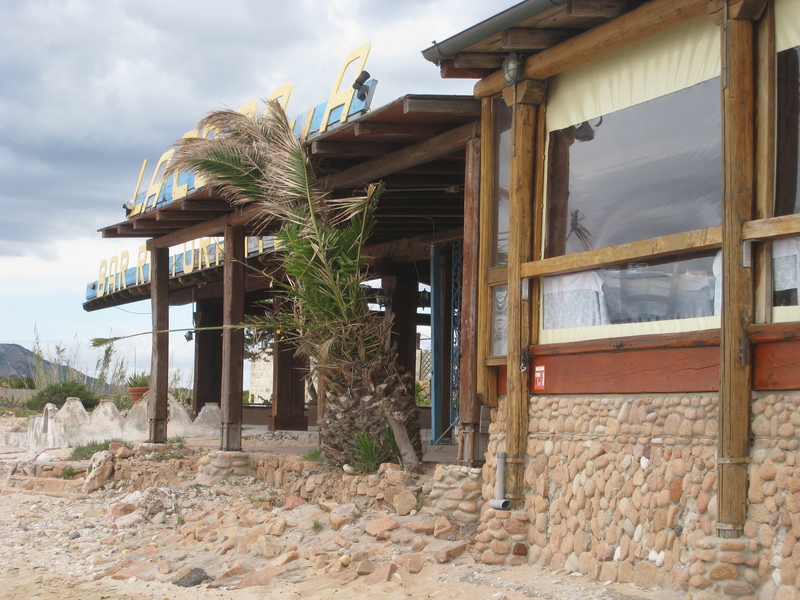 Another time, we’d probably go when the restaurant is open, wiling away our time in the consumption of local dishes and gazing at the unimpeded views of the Sardinian coastline, followed by a lazy siesta on the beach. 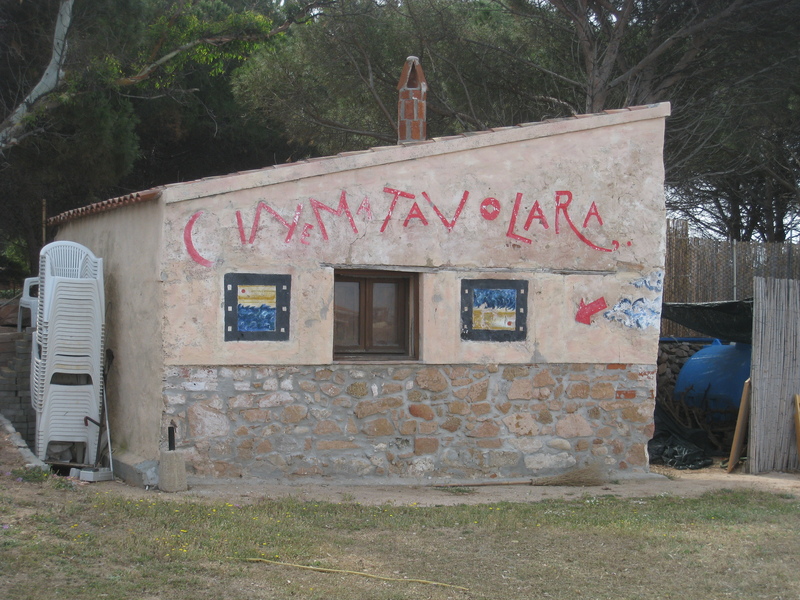 Alternatively, find out when the Tavolara film festival is on (usually July) to hob nob with Italy’s gliterrati of the cinema whilst watching Italian films and creative shorts capturing the beauty of Tavolara. In summary, and to experience the best of this peaceful place, don’t do as we did and go unprepared; either visit at a time when the restaurant is open or take a picnic. Load up with reading matter or snorkelling gear or something else to entertain you if you’re easily bored and then Tavolara will become a haven of tranquillity to be savoured.